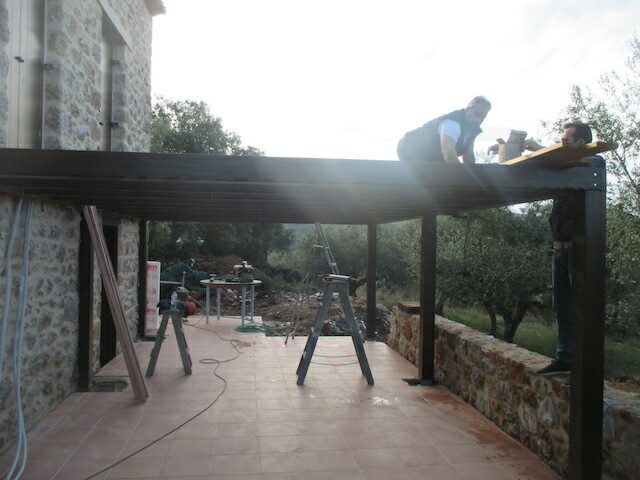 I am not sure folks will understand the point of the veranda until it is completed. But weather permitting that will be by Friday so here is a progress photo with the carpenter who has featured here so often, in action. The veranda runs on the convent side of the house in front of the kitchen but not the new wing so about two thirds if the house in length and is pretty deep, or will be. That means tt it will serve two purposes. Firstly you get onto it from the two floor to ceiling windows in the kitchen and there will be a table there where at certain times of the day you can eat outside. But underneath there is well over six foot of clear space. So it will be an area to eat in the shade at certain times of the day and also the scorpion zone, that is to say a dry area where I shall store wood from the land for use in the wood burning stove.